"There's a lot of life left in the shuttles, and everyone I talked to this morning feels the same," he said. "We're really sad to see them stop flying. It was really bittersweet." For some, the moment was breathtaking. Tracy: "I've never been to a launch, so this was my space shuttle moment. Seeing it fly over D.C. and being there for it was just incredible. What a feeling to see such an important and vital piece of American history. Thanks, Discovery. Can't wait to take a ride out to Dulles later this year to see it up close." Harsha: "I was stuck in traffic when I saw this today. I could not believe my eyes ... beautiful sight." Readers talked about the symbolism involved. 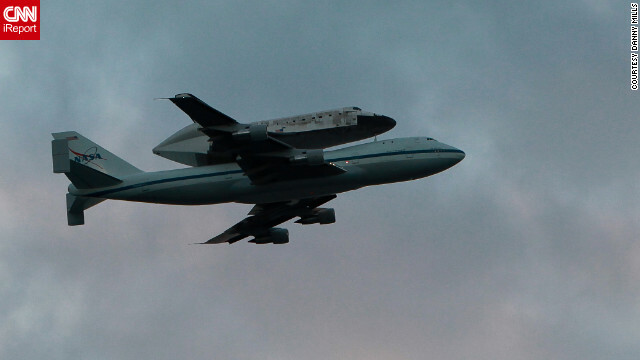 ScottN: "Sad to see the shuttle go but sadder for what it symbolizes. The deal was suppose to be the government stays out of our liberties and the people would support the government to do the real big things that were good for us as Americans. Now, our government has been bought by the "me" generation, the people care only about the size of their SUV, house and money they can stash in their pockets. I would say it was in pursuit of the almighty dollar except the dollar hasn't been almighty in a long time. Both sides have broken up the country. Education in science and technology is falling fast as we are out of the top 20 in both now. I'm glad I was around over the 50 years and saw how these things lift up a country and provide technology for everyone, not just the people who can buy it and sell it for a profit. Hopefully history will see this as when America bottomed out. It looks more like that we are accelerating the decline as selfish little children who can't figure out how to play nice and think more about the "us" in America anymore." One person wasn't thrilled about the traffic disruption. bencoates57: "You people make me sick. You disrupted traffic on the 14th Street Bridge by stopping, getting out of your car and sitting in wait for the shuttle. I leaned on my horn the whole time and other vehicles behind me joined in, causing many of you to cup you ears, grimace, and yell back at me. Well, I couldn't hear you over my car horns. What are you people, like, 5 years old? You couldn't care less about the shuttle since it rolled off the assembly line in 1980. Rubes. Some people have to work and get around in this city." Others discussed the technicalities of the flight. midranger: "I know that I'm supposed to use this post for political statements and to whine about how the government is wasting my tax dollars etc. but do any of you aeronautical types out there know, does that big sucker take advantage of the control surfaces on the shuttle when piggy backing it like that, or is it just along for the ride?" panzerman13: "The Shuttle is 'along for the ride.' It is fly by wire and since it is powered off and safed, no wire inputs to control surfaces are available." Some took a moment to express their appreciation. semper fi: "Thank you to all who were involved in our Space Shuttle journey. From my Father in Law who built the fuel tubes here in Huntington Beach California to the men and women who gave their lives to this program. ... We Salute You!" Many looked to the future. ihatearrogance: "Hear hear! Now let's move on to bigger and better things so that our grandchildren can say the same about us in 50 years!" One had a personal connection. NKBL: "My dad worked on the Apollo mission in the '60s and '70s. I cheer for all the people that were involved in the space program. I hope we don't become a nation of non-dreamers." Not everyone was feeling so joyful. Ed Sr of Dallas Tx: "Who really gives a crap! Nobody belongs in space except Captain Kirk and his starship! Everybody else is a wannabe nut who feels outer space will be conquered someday! Nuts galore abound in modern space science!" There was a debate over the value of space travel. rstlne: "Right now the Shuttle Discovery is being flown around Washington D.C., saluting the very people who have destroyed America's space program and who are now trying to destroy all scientific research in the United States. I find this to be yet another insult to all Americans who care about scientific research and discovery. Welcome to the United States – well on our way to becoming a third-world oligarchy where nothing matters but greed. Sad day indeed!" ihatearrogance: "The space program was not destroyed. The shuttle was beautiful and did its job, but it was getting very old and very expensive. NASA has moved money from the shuttle program to other programs involving deeper space missions. NASA is developing new rockets to reach further (Mars) with man inside. Until then, they're paying Russians and SpaceX to carry things up to the ISS. The space program is far from dead. Money has not been cut to NASA. Pick up a book and put down the Pabst Blue Ribbon." Is this an end or a beginning? Norasusan: "As I am watching Discovery take off from Cape Canaveral this morning, tears streamed down my face because this final flight represents the death of the space program. For me it proves that America took a 'giant leap' to becoming a third-rate has been like the British Empire and the once great exploring countries of Spain and Portugal. The space program is vital to our national defense, new inventions, and job creation. NASA should be building new, more efficient Saturn rockets to carry us back to the Moon and beyond. This is a disgrace." ihatearrogance: "This is not the end of the space program, not by a long shot. This is merely a step forward for the space program. The shuttle was old and used up. It was only a matter of time before the next one blew up. Also, it was getting incredibly expensive to operate. The best way to create new technology was to shut the shuttle program off and take all of that money and put it into the next projects, which are deep-space missions (Moon, Mars). Wake up people, you're making yourselves look bad." TAK: "Retiring the shuttles is not a disgrace. It was time to retire them. Thirty years ... would you drive a 30-year-old car or get on a 30 year old airliner? The disgrace, if any, is that we don't have their replacement ready." Share your opinion in the comments area below and in the latest stories on CNN.com. Or sound off on video via CNN iReport. I was there for the last shuttle launch ever. Had to get up at 2:30, spent the whole day commuting and waiting around – but it was worth it. I am terribly sad that my country has to let this program end. What is happening to my country is terrible. What has changed is the people of the USA. She is a magnificient aircraft and looked so beautiful on top of that 747. It is really hard to think that she will now be a museum piece but much better than someone tearing her apart. My deepest thats and appreciation to those that flew her, and to those that built her. 39 missions and over 140 million miles is a lasting tribute to all involved and what this country can accomplish! Would biting my nails if I was that pilot! Before the shuttle mounted the 747, did it at least take the 747 to dinner...or buy it flowers? Bob, I think you've had enough wine. Would ya stop hogging the covers! sheesh! The shuttle had only used about 1/3 of its life. This IS a disgrace. And by the way.... you fly in 30 year old planes EVERY day. President Bush ended the shuttle program, shame on him... but at least he had a replacement. President Obama simply ended the US supremacy in space period... shame on him. as well. With no replacement in place, the disbursement of the rocket scientists, the ending of research and progress... that is Obama's legacy. Shuttles are being displayed at seprate places...so WHO GETS THE ONE OF A KIND NASA PIGGYBACK JET??? Anyone?